Robert Alter’s ongoing translation of the Hebrew Bible into a new, more accurate and forceful English version is one of the most ambitious literary projects of this or any age. Turning the Bible into Greek, in the second century BCE, required seventy-two sages—which is why the Greek version is called the Septuagint (after the Latin word for “seventy”)—and the King James Version, in the early seventeenth century CE, was produced by a committee of forty-seven Anglican divines. Yet Alter, working alone, has already produced new English versions of the Pentateuch, I and II Samuel, and Psalms. Now he gives us new renderings of the books of Job, Proverbs, and Ecclesiastes—possibly the most challenging and perplexing works in all of Scripture. the blameless and the wicked he destroys. He mocks the innocent’s plight. the face of its judges He veils. If not He—then who else? 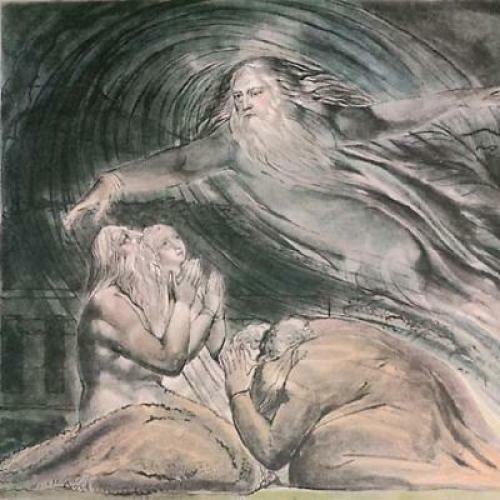 The force of Job’s protest is all the greater because it is set against the conventional pieties of his “comforters,” Eliphaz, Bildad, and Zophar, who respond to each of his laments with blind insistence that, if God punishes Job, Job must deserve it somehow. The irony is heightened by the fact that, as Alter writes, the comforters’ speech “abounds in familiar formulations closely analogous to what one encounters in many passages in Psalms…what this means is that much of their poetry verges on cliché.” Alter’s translation draws attention to the way poetic style in Job amplifies philosophical debate. While the comforters speak in clichés, Job coins remarkably vivid metaphors (“My days are swifter than the weaver’s shuttle./ They snap off without any hope”), which make his case against God still more forceful. his splendid snort is terror. in power goes out to the clash of arms. the thunder of captains, the shouts. This God, as martial and irresistible as a warhorse, is not the God who allowed Abraham to bargain for the lives of the innocent in Sodom. For the fate of the sons of man and the fate of the beast is a single fate. As one dies so dies the other, and all have a single spirit, and man’s advantage over the beast is naught, for everything is mere breath. Everything goes to a single place. Everything was from the dust, and everything goes back to the dust. Who knows whether man’s spirit goes upward and the beast’s spirit goes down to the earth? and your lips with a shout of joy. and the tent of the wicked gone. They that hate thee shall be clothed with shame; and the dwelling place of the wicked shall come to naught. But Alter’s versions are not destined to replace the King James Version; they are meant to strip away its familiarity, to help us see the Biblical text more closely and accurately. For this purpose, his commentary is as useful as the translation itself, as when he points out that the lines from Qohelet quoted above are a direct repudiation of Genesis. “In the Creation story, the human creature is brought into the world after the beasts and is enjoined to hold sway over all other living creatures. Here, man and beast are seen to share the same fate of mortality, and there is no qualitative difference between them.” Nothing but this was the radical insight of Darwin, which is why evolution is anathema to Biblical fundamentalists—but here is the Bible itself making the same disenchanting argument. It is enough to make you wonder how the Wisdom Books came to be a part of the Biblical canon in the first place. It would seem that, as Alter writes, “there must have been Hebrew readers…who were not willing to let go of Qohelet,” who cherished its literary power and human insight in spite, or maybe even because, of its “subversive skepticism.” The poets who wrote these books, and the editors and scribes who assembled and preserved them, are never more alive than when we can see them as suffering and questioning human beings—as Alter’s The Wisdom Books helps us to do.